(23137.16, Jane May Collection, OHS). (22055.14442.2, Ray Jacoby Collection, OHS). (21412.B29.28, Z. P. Meyers/Barney Hillerman Photographic Collection, OHS). Fred Jones, Oklahoma industrialist and civic leader, was one of the nation's largest automobile dealers. 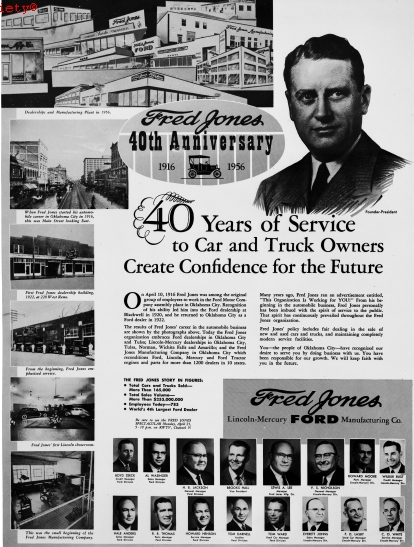 In addition to Ford and Lincoln-Mercury dealerships in Tulsa, Norman, and Oklahoma City, Jones pioneered the Fred Jones Manufacturing Company, the largest Ford Motor Company–authorized reconditioner of automotive products in the nation. Born in Georgia on March 9, 1892, Jones found work at the new Ford assembly plant in Oklahoma City in 1916. Moving from timekeeper to wholesale manager, he eventually realized that he had an interest in sales and became an automotive retailer. Jones opened his first Ford dealership in Oklahoma City in 1922. By 1926 programs such as all-night service, low payment plans, and a used-car program established Jones as the largest Ford dealer in the Southwest. In 1955 he was the nation's number-one seller of Ford cars and trucks, operating ten dealerships. In September 1938 four men began reconditioning engines and component parts in a four-hundred-square-foot corner of the service department of Jones's Oklahoma City dealership. Thus, the Fred Jones Manufacturing Company was born. During World War II the small remanufacturing department kept civilian automobiles operating. Appointed to the National Defense Advisory Commission (War Production Board) in 1940, Jones became a "dollar-a-year" man, his entire compensation for services to his country. In 1947 he opened a new assembly plant in downtown Oklahoma City to rebuild Ford, Lincoln, and Mercury products. Ford officials termed it the Southwest "little River Rouge" plant (a reference to the industrial city located southwest of Detroit, Michigan), as it utilized the same tools used in initial manufacture. Component parts constituted brake drums, generators, starter motors, carburetors, timing gears, alternators, and other parts that could be saved. All parts were cleaned and tested for quality assurance; any necessary new parts came from Ford Motor Company. By 1966 the Fred Jones Manufacturing Company occupied nine buildings, including an automatic transmission rebuilding division that opened in 1956. All comprised the "Fred Jones Village," the merchandising and manufacturing complex of Ford products, covering more than six blocks in downtown Oklahoma City. In 1968 Jones acquired and remodeled the old Ford assembly plant and moved his remanufacturing company to its four-story building. In 1971 the company rebuilt more than thirty-five thousand engines and 1.5 million components parts, serving twenty-five hundred dealers through district distribution offices and warehouses from New Mexico to Florida. By 1993 Fred Jones Industries, the parent firm composed of dealerships, automotive groups, and an electronics business, opened a second plant, in Bethany, Oklahoma, to rebuild General Motors transmission assemblies and electromechanical products. That same year the company received Ford's Q-1 rating for high quality and sought to expand the use of rebuilt automotive products overseas. In 1995 the company's remanufactured transmissions division moved to Westhall Commerce Center (an industrial park in west Oklahoma City). It was hailed as the nation's largest automatic transmission operation. In December 1996 Fred Jones Industries was the first Oklahoma company to receive the "Big Three" automakers' quality certification, the prestigious designation of QS-9000. Because Ford Motor Company wanted to rebuild its own auto parts, in 1999 the automaker did not renew its contract with the Oklahoma City firm. The Jones plant reconditioned its last engine in August 2000. 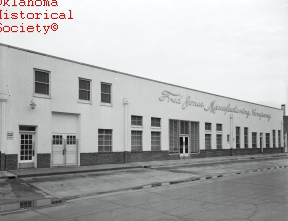 The Fred Jones Manufacturing Company maintained its distribution and warehouse office in Oklahoma City by converting the factory and renaming it Fred Jones Enterprises. It received new and remanufactured Ford parts and continued as the nation's largest Ford Motor Company Authorized Parts Distribution Center, primarily distributing warranty replacement and aftermarket engines, transmission assemblies, and power train components. In 2002 Fred Jones Enterprises added to its corporate offices, creating the Fred Jones Business Development Center to provide support services and resources to Oklahoma entrepreneurs. Involved in every aspect of the automotive parts industry including remanufacturing, distribution, and servicing vehicles, Jones died on June 1, 1971, in Oklahoma City. His numerous honors from the automotive industry included the 1966 Ford Citizen of the Year award bestowed by Henry Ford II. 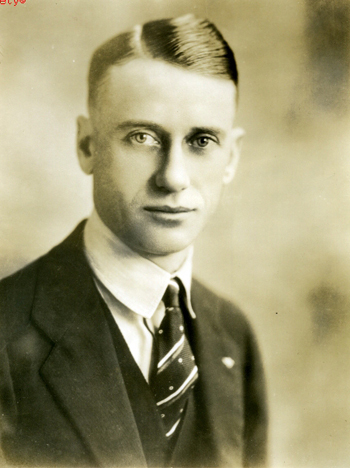 Jones was inducted into the Oklahoma Hall of Fame (1965) and the Automotive Hall of Fame (1994) for his distinguished service as one of the nation's most significant industrialists. Daily Oklahoman (Oklahoma City), 16 March 1968 and 2 June 1971. Fred Jones Industries: Forward Unlimited (Oklahoma City, Okla.: Pate Organization, 1979). "Fred Jones Manufacturing Company," Vertical File, Research Division, Oklahoma Historical Society, Oklahoma City. Tally D. Fugate, "Fred Jones Manufacturing Company," The Encyclopedia of Oklahoma History and Culture, https://www.okhistory.org/publications/enc/entry.php?entry=FR009.